What does it take to get a world-renowned pop star to make a new album over a decade after his last, when he’s clearly turned his back on the music industry? Well, in Julian Lennon’s case, I suspect it was just time. He’s a fine songwriter, and songs were bound to start haunting him if he tried to ignore them long enough. That’s the image I have in my mind of what really happened, and I’d love to hear Julian’s thoughts on it. Maybe I’ll ask him when the review is done. 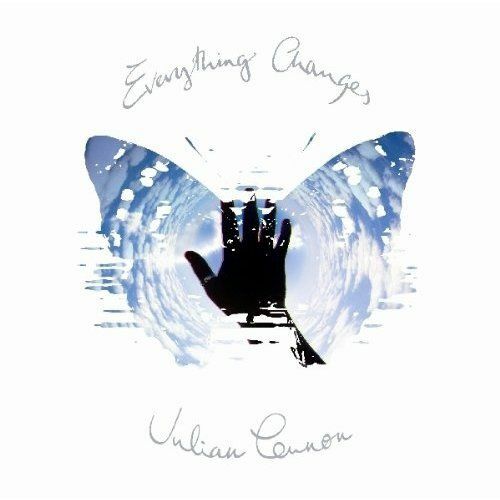 tl;dr Version: Julian Lennon has tried a lot of styles on for size over the years, but this comeback album marks a distinct change in direction, sonically. ‘Splain, Lucy Version: I tease about the ‘comeback’ thing, though I know how it can grate on an artist to think that they are essentially slogging up that hill again despite their years of achievement and celebrity (or notoriety; your pick). In the case of Julian Lennon, though, it really is a comeback, as he actually quit the business for over a decade, taking his time, running a restaurant in Spain, and essentially being a proper Englishman Gentleman Abroad (except for the whole ‘conquering nations for Queen and Country’ thing). What few interviews I’ve read in the intervening years lead me to believe he would come back some day, when the muses had stirred him enough to write an album’s worth of songs. Lo and behold, here we are, and that’s what has happened, and it’s a good album. Just saying. Boring Version: Julian has long lived under the shadow of his famous father (whom you may have heard of). The thing is, Julian’s own relationship with his dad wasn’t always so good. John left Julian’s mother, Cynthia, when Julian was just a boy. The famous Beatle ballad, ‘Hey Jude’, was written by Paul McCartney expressly to console the young boy, but in many ways, and no doubt in part because of the years of neglect his father showed him during the Yoko years, Julian doesn’t really have all that much to say about his father that springs from a happy place. And who can blame him, really? However, that’s neither here nor there. I only write these thougths because I’ve never had to write my thoughts on Julian’s lack of a solid father figure before now. I know how it can be, growing up lacking a proper male role model; my own father had left (he was welcome to leave, let’s put it that way) before I could walk, and the man I called Dad was in and out of jail and finally just gone before I hit my teens. Warren’s still alive somewhere, but I can’t even bury the hatchet with Joe, because he’s no longer with us, either. So in many ways, I truly identify with Julian, though neither I nor either of my ‘dads’ is/was a famous pop star. I was at least spared the pain of having to grow up in the man’s absentee shadow. Anything I make of myself will be an improvement on the legacy they left behind. It’s probably not necessary, and in many ways, it’s probably not even desirable to bring up all of this up. It was just the 500 lb gorilla in the room, so I addressed it. Time to move on, as I’m sure Julian has done by now. The real news is that, after all this time, Julian still feels drawn to music, in a business that hasn’t always been good to him. I only know a little about the reasons he felt the need to stop making pop records over the last decade, and I think it would be unfair to heap (more) pointless conjecture on his motives for stopping OR starting up again. I refuse to be cynical about it. Julian has new songs for us. I’m not sure how many people listened to his album when it was released last year. I’m not sure one lone review can bring him any more listeners than he already has. But I write these reviews to commemorate albums I think are good and enjoyable and important. There are albums I’ve been planning to review from the last few years that I haven’t gotten around to because, to be honest, they just don’t seem to be that important to me. Something about the last year of music has changed (like the title of this review). Lots of old and new artists putting out albums that have just renewed the musical landscape. It’s a good time to be a music fan, I think. Title track Everything Changes opens the album simply with a plaintive piano melody over a rhythm section that includes an acoustic guitar, which the drums double time into the chorus, and the vocal melodies are incredibly evocative. Again, it’s Julian in Message Man mode, but it’s not as cloying as some of his previous efforts. It’s actually gorgeous and perfect, or at least as perfect as four-minute meditations can be. But hey, you can always put the song on repeat until it does the trick. Idon’t think you’ll get bored of it; it’s a lovely song. Lookin’ 4 Love starts as a fairly conventional piano number, just Julian playing and singing, until he chimes in the drums and bass, and it turns into a pretty solid pop song, with a lovely middle eight and a cool instrumental guitar solo that doesn’t overstay its welcome. It’s a very nice, moving piece of song craft, and the lyric would seem to indicate that he’s still exploring themes of love and loss that have haunted him his entire career, though I haven’t kept up with the latest gossip, so I don’t know how true to life it is. Hold On starts with piano, but quickly introduces an electronic rhythm section that wouldn’t be out of place in a 90s electronic chill album, but the chorus chord progression is very good. Some of the same chord progression has been tried in some of his older work, but there it was strident, where here it’s relaxed and contemplative, introspective, pleading. The song veers further into chill track territory (think Deep Forest) for the middle eight, but then returns to the piano-and-strings combo, which is gorgeous and warm and makes up for the slightly sterile feel of the electronic rhythm section. A very pretty song. Touch The Sky opens with an electronic lounge rhythm reminiscent of Portishead, but is followed by a big, gorgeous chorus complete with slide guitar. There’s also a really nice bridge to the middle eight, which goes into a minor key and then leads back to the big chorus, which I should say isn’t a simple little thing, because it’s here that Julian gets to deliver his message. The song has a Duran Duran circa Ordinary World vibe, but is somehow bigger, warmer. I probably just like Julian’s voice better. Invisible opens with electric piano (Wurlitzer? Nah, I think it must be Fender Rhodes), but has a nice live rhythm section that warms up nicely and has a slightly Beatlesque vibe, particularly in the middle eight. Some people might tire of Julian flirting with his father’s canon, but I think he does it wonderfully and creatively, and to be frank, who else has more right to it? If the children of the Beatles can’t use some of the old sounds in new ways, then none of us should, which wouldn’t be any damned fun for us Beatle fans. Just For You has an interesting Eastern rhythm and some nice sitar, juxtaposed against a great fretless bass line and a really raucous chorus where Julian gets to demonstrate some o f those old rock chops of his. There’s a nice bit with a dobro bridging to another verse, and then the huge chorus returns, Julian belting like a champion, telling us all of the things he’s done to love us. I’m flattered, really. I didn’t know we were getting so close. But seriously, this is a nice reminder that Julian spent the better part of the 80s and 90s as a rock singer, even if his perfect pop pedigree always kept him from quite achieving rock godhood. Always begins with a bass chord progression soon joined by the rest of the band, vamping on a minor key riff that leads up to a down tempo piano song, plaintive verses balanced against a nice, clean chorus and soaring vocals and an elegant background vocal performance. The middle eight is restrained and quiet, helping to build the tension that resolves with the final outro chorus, allowing for some nice drum runs. It’s a moody but effective song written by a guy with a guileless social conscience. It goes out slow and quiet, letting the message sink in. Disconnected uses some Middle Eastern orchestral touches to evoke an exotic feel for what is essentially a minor key modal piano progression. The tune has a very Moroccan Roll vibe, which I’m a sucker for. I really like the bass work here, and the spacey bridges between the verses and the gigantic choruses are nice and effective without ever having to join the volume race. The song slips into a shifting time signature for the outro, performed on acoustic guitar, building to a rather lovely recapitulation of the bridge riff and then back to the chorus, slipping in lots of exotic flavour and then going out on that guitar riff and excited rhythm section, capturing some of that Zeppelinesque vibe they were doubtless going for. This is probably my favourite track from the album, as you can probably guess. Never Let You Go almost starts with an Indian musical section that feels like a tribute to George Harrison, though I’m sure that’s not the case. Even if it were so, the chorus goes its own route, and then after the second chorus, the middle section takes on an almost lounge Beach Boys feel, which leads to the chorus being performed in a rock vein, the sound finally opening up and letting loose. The song goes out on that Indian vibe, tablas and other instrumentation augmented by a piano playing the main melody. Guess It Was Me is a pretty casual, steady mid-tempo number with a rather complex but elegant chord progression. It’s got a nice hook in the chorus, feeling a little like Tears For Fears doing a Beatles pastiche, including a nicely psychedelic instrumental section, but the bridge is a bit too close to what Oasis would use for a bridge when ripping on the Fabs. Again I invoked the Son Of A Beatle Rule, and have to admit, I like it all the more for the liberties it takes. Don’t Wake Me Up opens on a CP-80 (?) melody, and doesn’t do anything but get prettier by the minute. It sounds like it could be a closing movie track. It shifts into a bit with some lovely blues guitar, before returning to the warm, cinematic chorus, and Julian getting his message in there one more time, before the bluesy, David Gilmour-style playing takes us out. Beautiful is another lovely piano song, this time with Julian singing closer to his lower register, though he never seems to break out his cool and commanding lower register voice, here or anywhere on the album. It’s a lovely song with some gorgeous harmonies in the chorus and some very tasteful strings to augment the piano. The instrumental section has some slide guitar playing in amongst the piano and strings, but briefly, reminding us that this is definitely a songwriter’s album, and wastes no time on needless histrionics. I could almost do with some soaring guitar right here, but the song is about the words, and my sensibilities would probably ruin the effect. All in all a lovely album, if a little mild. I wasn’t expecting Julian to rock out wildly on this album, as it has been quite some time since he played rock and roll, and these songs were primarily written over a lengthy period of time by a guy at a piano, which tends to yield a certain kind of music, no matter how you arrange it afterwards. For all that, I find it quite enjoyable if not staggeringly infectious. It’s certainly a very mature, confident effort from a guy who knows what his music is about and feels no need to try to impress you with anything other than sheer songcraft. This is an album you can put on and share with all of those friends and family members who think your musical tastes are perhaps a little too far out there. If you can enjoy this album enough, you might find it a good one to slip on when company is over. Who knows? You might even score! More seriously, though, it’s a lovely, lush album with no dud tracks on it (at least for me, but I’m a songwriter, so I speak the language, as my wife likes to point out). The main point is that this is a solid return to form for Julian Lennon, and I sincerely hope he doesn’t make us wait another decade before delivering his next collection of songs. And for Julian, if you’re reading this… Thank You. If Julian doesn’t have good memories of his father, that’s understandable. However, the DNA can’t be denied, and songwriting (and singing) is in his genes! I tend to agree, although I tend to chalk it up to how he grew up and in what circles he’s moved over the decades. The music he heard as a child was bound to influence his listening habits of later years. Julian liked your review. =) =) He linked it on his FB wall. Yes, which was very, very sweet of him. Lee Edward McIlmoyle what on Earth are you doing babbling…do the reviews and stop feeling sorry for yourself! Thank you, though I’m pretty sure I muffed a few things. Not having been there, I can only guess at stuff, and Julian confirms that I got some of the details wrong. Still, it was fun having a guess. It’s a particular kind of cultural conundrum for a son to follow in a field where his father was one of the undisputed all-time greats. That said, I think Julian has done brilliantly. In spite of being badly mishandled by his record company(ies) early in his career, he’s created a terrific body of work. “Valotte” “Help Yourself” “Photographic Smile” and this new album are efforts any songwriter could justifiably be proud of. I know he works at his own pace, and so he should. But a new album by Julian is, for me, always something to look forward to. Thank you, and I apologize for any errata. I’m a dilettante by comparison, and I do get things wrong often enough. You should hear the mess I made of a complex vocal harmony I recorded today. I was sure it was working, but playbacks don’t lie: It’s mud. Any road, thank you so much. And I greatly look forward to hearing the remix album when it’s ready. Being an oldies rocker, I fell in love with John Lennon at the age of 13 or so, listening to my brothers’ 8-tracks. When I discovered Julian, recently, at first I felt like the universe had given a part of John back to me. Then I thought how horribly unfair that was and how degrading to Julian, to view him as “part” of another person. He does look and sometimes sounds hauntingly like John, like John is channeling through him or something. But now, I can hear that element, appreciate the magic of it, and still hear the artist Julian Lennon as an amazingly, incredibly, multi-talented artist himself. I’ve just gone through that transition of comparing him to John to loving him for himself. And I do love him, of course I mean I love his music. I’ve never been privileged to know him personally, maybe someday our paths will miraculously cross. Whether they do or not, I want to collect ALL of his albums now. I’m a hopeless fan, totally into Julian Lennon and selling him (that sounded silly), pushing him (that sounds even sillier), SHARING (that’ll have to do) with my husband and everyone else I can get to loan me an ear. I only have Everything Changes right now, but I plan to collect all of his albums. And he’s not an egomaniac, which would be so easy to become having the DNA of a Beatle. I think he shows radical humility and is very real. That shines through his music and his FB shares. And his voice is to die for!!!!! Julian strikes me as the most down-to-Earth pop star I’ve ever come across. I think he’s brilliant. Reblogged this on sandra's blog. Great review on an even greater album…Well done Julian….love it!